The incumbent president of Kazakhstan, Nursultan Nazarbayev (pictured at right), will head into his third decade in office after a landslide victory in Sunday elections in which the 70-year-old leader had no genuine opponents. International monitors, while recognizing the progress the elections represented, said the elections fell short of meeting international standards for democratic elections. According to preliminary results issued by the Central Election Commission, Nazarbayev won 95.5 percent of the popular vote with the other three candidates receiving less than 1 percent. Nearly 90 percent of eligible voters cast their ballots on Sunday. Some voters consider the massive turnout to be a sign of patriotism and the overwhelming belief in the future of democracy in Kazakhstan; others are more skeptical and say that the turnout is reminiscent of the communist era, when people voted to avoid repercussions from the institutions where they worked or studied. For many citizens of Kazakhstan, the ninth largest country in the world by area, Nazarbayev’s leadership is associated with prosperity. The country of 15.5 million has an economy larger than all other Central Asian nations combined and enjoyed a 7 percent growth in GDP in 2010. It is one of the three major producers of uranium in the world, and it holds about 3 percent of the world’s oil reserves, primarily concentrated around the Caspian Sea. According to some estimates, Kazakhstan is expected to enter the world’s Top Ten exporters of crude by 2015. Nazarbayev managed to balance economic and strategic relations with Kazakhstan’s neighbors, Russia to the north and China to the east, as well as the United States and European Union. 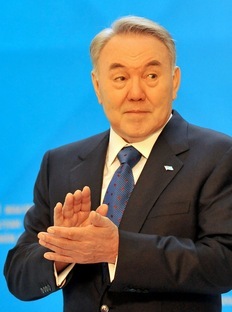 The elections were initially scheduled to take place in 2012, but in early 2011 the parliament controlled by Nazarbayev’s party Nur-Otan voted for a referendum to extend his rule until 2020. The Constitutional Council ruled against it. In February, both chambers of parliament passed an amendment to the constitution authorizing the president to call for snap elections, which he then did. The most prominent opposition parties, including Alga! DVK, boycotted the elections, saying that they did not have enough time to prepare and that the government has not provided the necessary conditions to hold fair elections and allow voters make an informed choice. These elections, said Assenova, despite their irregularities, were better conducted than previous ones, though the electorate still needs to be better informed about the process of registration and voting. The OSCE, which Kazakhstan chaired last year, said that “reforms necessary for holding genuine democratic elections have yet to materialize” in the country. “We have to conclude that this election could and should have been better,” said Ambassador Daan Everts, head of the long-term election observation mission which deployed nearly 400 observers from the OSCE Office for Democratic Institutions and Human Rights. Nazarbayev’s victory came as no surprise. In the 2005 presidential elections, the voter turnout was close to 77 percent and Nazarbayev was elected by 91.2 percent majority. He came to power in 1989 as the first chairman of the Communist Party of the Soviet Republic of Kazakhstan, and he has continued as leader of the independent country ever since the dissolution of the Soviet Union in 1991. Although the constitution limits the presidency to two five-year terms, Nazarbayev was exempted from this limitation in 2007. He remains popular despite what his critics call suppression of independent media, limitations on freedom of assembly and other opposition, and alleged nepotism and corruption. The extravagant lifestyle of some Kazakhstani elites was revealed last year by the Web site WikiLeaks. The secret U.S. Embassy cables sent from the capital Astana talk about private concerts by Elton John and Nelly Furtado hosted by the family of Nazarbayev’s son-in-law Kulyabayev, presidential visits to a horse farm with a rumored “second wife,” and Nazarbayev’s affinity for warm weather — which he is said to enjoy in a “palace” in the United Arab Emirates. Revenue from natural resources allowed the government of Kazakhstan to build a lavish capital in Astana in the heart of the Central Asian steppe, and to sponsor numerous university degrees for Kazakhstani students abroad through the “Bolashak” program. “We are not going to become a fully developed democracy overnight,” he wrote.